My family went to New York for our summer vacation this year. It was my first time there. We took a red-eye flight. My wife and I are no dummies. Our 3-year-old son doesn’t like to sit anywhere for more than one minute. So instead of him being awake, bored and antsy on the plane, he’d be asleep. My wife and I would sleep, too. We got to the Bob Hope Airport in Burbank a few hours before our flight boarded. We checked in, and then got dinner. At the restaurant, my son asked for a Cherry Coke with his meal. My wife and I, who don’t give our boy soda because it puts his already hyper personality into an amphetamine-like frenzy, deliberated on the matter, really breaking down the facts the way a jury might do before they send a man to prison for life. The sugar and caffeine didn’t affect the kid like we thought it would. Our son was actually fairly calm for having consumed a full glass of soda. And then it was time to board our plane. The soft drink finally kicked in -- and at full power. My son was bouncing off the walls like a pinball. The passengers, mostly New Yorkers on their way home, who wanted desperately to sleep, eyed my wife and me like we’d just brought an earthquake on board. Now, Californians can be your best friends. They’ll spend time with you and dine with you -- even though behind your back they might hate you. New Yorkers, on the other hand, will just kill you if they didn’t like you. Well, these New York passengers, who were about to be denied sleep because our juiced-up son was as loud as a firecracker, were ready to eject all three of us out of the aircraft -- in mid-flight if it pleased them. Luckily, the sound of the plane as it rolled down the tarmac to the runway put my son right to sleep. My family was saved. It was just past 10 p.m., our flight was on its way, and we could all sit back, relax and sleep. Before the plane could even take off, it seemed everyone in the cabin had fallen asleep. Having never flown on jetBlue before with their cable TV at each seat, I was wide-awake for the duration of the flight watching “The Godfather” movies, even though I’d seen the movies more than 400 times before. So much for sleeping. The next day, we arrived in New York before most people wake up. My wife and son were revived from a good night’s sleep, and they were ready to go. I was ready for a long nap. I pounded a cherry soda, which gave me the energy I needed to survive the rest of the day, and then we began exploring the city. In New York, people are very straightforward. “How are you?” you ask. In California, people tell you what you want to hear. “Great,” they say. Then they ask how you’re doing. By the time you answer, they’re already halfway down the block. Everything’s a question in New York. Let’s say a New Yorker is with someone he doesn’t like. 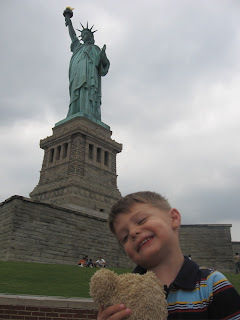 In New York, dozens of strangers touched my son -- you know, patting his hair and such. One guy even dropped his cell phone while patting my son on the head. “What a good boy,” he said, even though the guy just watched his $200 phone hit the ground and shatter into 100 pieces. In California, if a stranger patted a kid’s head, he’d be arrested for child molestation. One night, while strolling down Mulberry Street in Little Italy, my family came across a restaurant owner who initiated conversation with my son. The dialogue exchange started small but became epic. So my wife and I were inclined to dine at the guy’s place. A little later, that same guy came over to our table, grabbed my son and took him over to meet a group of good-looking female customers at the other end of the room. In California, that’d be called kidnapping. But no harm was done. When the man came back with our son, my wife and I learned that our little boy got a kiss from each of the girls at the other table. Mind you, all of these girls were over 18. In California, they’d all be on the 6 o’clock news for having had relations with an underage boy. At a New York restaurant one evening, my wife asked our waiter if he preferred a certain seafood dish or a certain chicken dish. The waiter said he preferred neither. My wife then asked what he recommended. The waiter was stumped. He had to look at the menu to find a dish he liked. During a pause that was very unsettling and could’ve lasted the remainder of our trip, my wife finally just said she’d have what I was having. Luckily the food was great. In California, my wife always asks waiters what they prefer. California waiters usually respond with, “Everything on the menu is excellent.” Then we get the food and it’s terrible. New York restaurants don’t use a lettered rating system like we have in Los Angeles, where an establishment’s cleanliness grade -- A or B for example -- is posted on the front window. My family probably went to at least three places in New York that deserved a D rating. Not cool. In New York, people consider their horn as important as -- if not more important than -- the gas and brake pedals. These people can’t drive two car lengths without honking. In California, drivers are told to drive with their hands at 10 and 2 on the steering wheel. In New York, motorists keep their hands at 10 and . . . on the horn. But one thing’s for sure -- people move fast in New York regardless of the driving conditions. Coming from the land of rubberneckers, I was in heaven. We also saw the 9/11 Memorial Site where the Twin Towers once stood. During the whole vacation, my family was very talkative, especially my son, whose chatter sometimes blends into the background noise because it’s so constant. But when we got to Ground Zero, we all became quiet. And we didn’t have any family pep talk ahead of time, saying we’d be quiet and respectful. We just all stopped talking -- even my son. Seeing that hole in the city was very sad. A very friendly airport official at Burbank welcomed us Californians home. “Thanks,” my wife and I said. “I love that Hawaiian shirt,” the lady said to me. I thanked her.